Colombia has announced the pardon of 23 members of the left-wing Farc guerrilla group, to encourage a reciprocal move. The government's chief peace negotiator said: "We hope this act... will mean that very soon the people who have been unjustly kidnapped will be returned." President Alvaro Uribe said in October that he was ready to talk about an exchange with the rebel group. 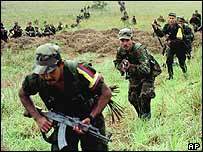 Farc is said to be holding about 1,600 hostages, and has demanded the release of thousands of its own members. The government is hoping to win the release of dozens of hostages, including three Americans. In November, Farc rejected a proposal to hand over 59 of its captives in exchange for 50 guerrillas imprisoned by the government. There was no immediate response from Farc to the latest gesture. The government said the 23 rebels to be released were all of low rank and had promised not to rejoin the armed struggle. Meanwhile, Farc has denied it had plans to kill US President George W Bush during his recent visit to the country. Mr Bush held talks with President Uribe in the seaside city of Cartagena on 22 November. US intelligence officials said there were reports of a planned attack, and later the Colombian defence minister said Farc wanted to assassinate President Bush. The group issued a statement on Wednesday saying: "We, the Farc, categorically deny the slanderous affirmations of the US intelligence services accusing us of a supposed plan to eliminate presidents Bush and Alvaro Uribe."